Walk down the dairy aisle in any big supermarket and the special offers jump off the shelves. “Four pints for one pound”, trumpets one brand, while another offers “Two litres for eighty-nine pence”. Consumers have never had it so good. Open a newspaper or turn on the television set and their reports tell a whole different story. Farmers have mounted protests inside and outside the major grocery stores, buying all of the available milk and then giving it away for free to shoppers in the car park to highlight the low prices they’re being paid. The end of the European Union’s milk quotas on 1 April were designed to let the continent’s producers compete for a share of fast-growing markets in China and other parts of Asia, yet their removal created a further headache for Scottish dairy farmers. The shockwaves have been felt throughout the industry, with processors limited in the prices they can pay farmers after being squeezed by retailers wanting bargains for shoppers. Diversification has been suggested as one solution. Politicians have highlighted the success of companies that have moved up the value chain by producing everything from butter and cheese through to ice cream and yoghurt from their milk. When it came to their first steps, necessity was the mother of invention for the Mackie family, who have been farming at Westertown in Aberdeenshire since 1912. The business had expanded into doorstep deliveries but, by the early 1980s, more people were buying milk from the shop rather than the milkman and semi-skimmed was replacing full cream. The family needed an outlet for its spare cream and so opened its famous ice cream factory in 1986. The biggest leap – from sweet to savoury – came in 2009 when Mackie’s teamed up with the Taylor family in Perthshire to launch a range of crisps. 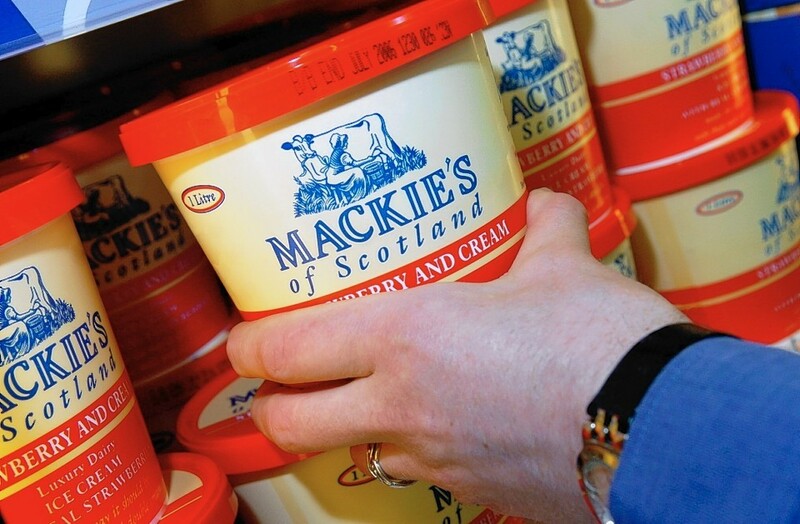 Last year, Mackie’s launched its own range of chocolate and the company is now moving production from a test centre in Arbroath to a purpose-built chocolate factory on the farm, where it will join a sweetie kitchen, an ice cube business and a plastic tub factory. Turnover from the ice cream business has grown to £11million, while the Mackie’s at Taypack joint venture brings in £5million and the company is on course to sell £1million of chocolate over the coming year. Further diversifications have included erecting four wind turbines, commissioning a biomass heating system and installing Scotland’s largest solar farm. Other farmers have concentrated on different products. When liquid milk prices were low, brothers Callum and Cameron Clark and their wives Jill and Eileen looked for ways to gain more control over their financial future. They did their homework and commissioned market research, which found demand for cheese looked like it would continue to rise. In January 2006, they launched Connage Highland Dairy from the family farm at Ardersier, between Nairn and Inverness. The cheese business cost around £500,000 to set up, including some support coming from Highlands & Islands Enterprise and the Scottish Government. Nearly ten years later and the dairy is turning over more than £600,000 a year and its cheeses are selling as far afield as Germany, Japan, Singapore and the United States. The family uses milk from its herd of about 150 cows, mostly Holstein Friesian with Jersey crosses and Norwegian Reds, which graze on organic land along the Moray Firth. “We’re always on the lookout for new markets,” explains Callum. “Around 80% of our business is done through wholesale to high-end hotels, delis and the cheese pantry outlet at our factory. Over on the other side of Nairn sits a processing plant owned by Stirling-based Graham’s, whose strapline “The Family Dairy” has become one of the best-known marketing slogans of recent years. The plant was built by the local Claymore Creamery when it moved from its old town centre site, before passing through several owners until Graham’s bought it in 2010 from its management team. “We’ve invested money and it’s a good site, with good people there, who do a good job for us,” says managing director Robert Graham, the third generation of his family to run the business, which was founded in 1939. “Turning it around has taken a lot of money and a lot of energy. Graham’s has spent £1million adding a yoghurt factory to the site, which was officially opened by economy minister and local MSP Fergus Ewing in August. The facility also continues to process all of the milk for Graham’s customers in the Highlands and the north-east. Yoghurt is the latest in a string of products introduced by Graham’s, which launched its butter in 2005 and followed with ice cream in 2011. Earlier this year the firm unveiled its spreadable butters, a market that Graham believes is ripe for growth. His comments are echoed by George Jamieson, dairy policy manager at the National Farmers’ Union (NFU) Scotland. He encourages shoppers to look for the red tractor logo, which guarantees the quality of British produce, and for retailers adding the saltire to their packaging, to denote milk that’s been produced and processed in Scotland. While many companies have tasted success through diversifying from farming into the broader food sector, some of those who have travelled down the road offer a word of caution. “Diversification is not for everyone,” says Callum Clark. “There are farmers who tend to think they can master everything easily, but the grass is always greener, no matter what sector you’re in. If you go into a new area then make sure you’ve done your market research and you’re prepared to go through the ups and downs. Mr Graham agrees diversification brings fresh challenges. “There are different disciplines between working in a milking parlour and working in a food factory,” he says. “There are some similarities but there are also some big, big differences. Mr Jamieson points out that, for many farmers, diversification is their wife going out to work to bring in a second income to help to smooth out dips in milk prices. If a farmer’s partner has a career then he suggests they will have to look long and hard at the economics of distracting her from her profession to “dabble” in diversification such as running a bed and breakfast or making cheese. He highlights the popularity of anaerobic digesters – in which bacteria feed off slurry to produce gas to generate electricity – and thinks smaller farms could work together to share such units. Collaboration between farmers and between other members of the supply chain – such as processors and retailers – is at the heart of Mr Jamieson’s vision for the longer-term future of the dairy industry. “We have to be globally competitive, so we have to work together,” he says. “Farmers need to collaborate with one another, both in terms of managing efficiency and volume supply. “We need the supply chain to be more open to sharing risk and reward. For me, that’s a no-brainer because everybody has to reinvest in their business, whether it’s a farmer, processor or retailer, plus the consumer wants a good deal.